Some people love shoes. Some love bags. I happen to love Fitbits. “It will help with your steps,” my 7 year old daughter said to me after asking for a glass of water only after I had already tucked her into bed. I didn’t notice that my obsession with Fitbit was absorbed by my child. But I knew my mother caught it when I gave her my Flex in September. If she doesn’t reach her goal by the end of the night, she is known to pace in the house or go around the block before midnight when the counter starts over. My love of Fitbit started a few years ago when my good friend told me she was wearing one. I started with an Ultra – it was a great product right out of the gate – the customized messages, the display, battery life and clip. After 18 months, I lost it. I tried to wait it out, it had to turn up somewhere, but it never did. I then started hearing about the Flex (wristband) and I put my name on a waiting list and waited. I got it two days before a trip to Italy – which was great because I could track our steps during the trip. I still haven’t beat the record day where we reached 18,000 steps walking through Venice. But unlinke the Ultra, the Flex didn’t give me the immediate gratification or messaging – everything that I used to be able to see on the Ultra was only accessible on the FitBit app or site. But I longed to see it right in front of me on my wrist. And foolishly I thought it could double as a watch like the Nike Fuel Band, but the Flex was design just showing progress lights. So I needed to wear both a watch and a FitBit. I did love Flex’s addition of the silent alarm and sleep tracker, which the Ultra didn’t nail. In September I gave the Flex to my mom and I bought the One. All of a sudden the investment I stressed over was not an issue, I no longer ‘wanted it’ I needed it. The One is really good, but the part that was missing was the personal connection with people (and effective sleep tracker.) 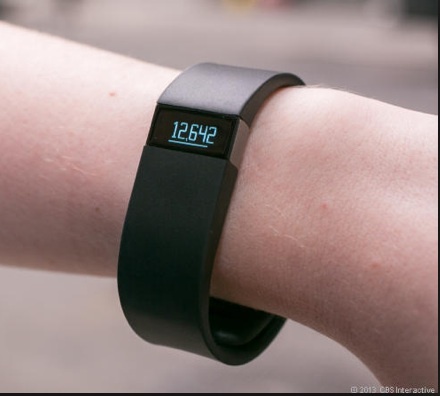 There is a small connection that is made when you see others wearing a Fitbit. You don’t even have to talk about it, but you just have a something in common. You can’t get that when you wear a Fitbit on your waist under your clothes. When I heard that Force, was coming out I put it on my Christmas list, knowing that my obsession is bordering ridiculous. Then as fate would allow, when I was packing for my holiday vacation, I found the Ultra that I had lost so long ago in my suitcase. My husband did end up getting me the Force for Christmas and it is the BEST one yet. I now have the One, the found Ultra and my Force gift. So I will pass on my obsession by finding good homes for the One and the Ultra. The Force is a wristband and acts as a watch, it celebrates with lights and vibration when you get to your goal, there is a silent alarm, you wear it on your wrist, it tracks steps, stairs, miles and activity level and the battery life is incredible. I’m looking forward to CES to see where the wearable technology category is going. a way to count the effort from a Power Yoga class. You know I’ll buy it. This was my first year at SXSW Interactive. I was unprepared. I am a planner to my core. SXSW is different, you simply can’t prepare in the normal sense of planning what sessions you will attend, making dinner reservations, getting the right invitations to the after hour parties, scheduling business meetings with potential partners, etc. The way to prepare for SXSW is to take classes in mediation and to embrace the theory of going with the flow. Truly – let go! This post is for my future self and what I will do differently for next year; and it is for my present self – lessons to apply to my everyday life. Don’t check the twitter stream when you are in a session that you are enjoying; no matter how good Seth McFarlane is, you will find yourself clenching your fist when you read that Jimmy Fallon is tearing it up at the Nike tent across the street. Stay present in the moment you are in. Don’t check your wall or stream or Instagram, you will find things that may be more interesting that you could be doing – but now you’re not only NOT doing that but you are NOT enjoying what you are actually doing. This concept was actually a topic for a session where the question was asked Is Social killing Social? Good question for the next dinner party – try it especially in mixed generations. It’s ok to indulge in the persistent use of devices with screens. It’s ok to not look up at all during a session even though there is a live person on stage. It’s ok to check in. It’s ok to tweet. All the time. Even if you opt out of being able to tell people back home what Austin topography is like. Save that behavior for Austin. But be willing to change your steadfast rule, as you may stumble across an energizing panel on How to Hire the Right People like my colleague did. He is a technologist (aka geek) and was more energized from that one session than most anything else he saw at SXSW. Be open. You may be surprised. Don’t put off what you can do today until tomorrow. Make plans, you can always adjust. Plans, like education, give you options. Don’t amble, lead the group. You’ll know when you’ve gone too far. It’s always better to have colleagues/friends to attend sessions with, but at the end of the day you have to do what interests you and you can’t wait to see what everyone else is doing and if they will get there. Most times I did change my mind minutes before a session because someone would suggest something that sounded better than what I originally picked. That’s how I saw Seth McFarland with Mark Wahlberg talking about Ted Movie and Jeffrey Tambor’s Acting Workshop. See #3 AND once a decision is made go for it with gusto. Pack an umbrella and two raincoats (light and heavy), then do a rain dance. If it hadn’t rained Thursday, Friday, Saturday and the morning of Sunday, I would have had a very hard time staying indoors absorbing all the great discussions, presentations and conversation. On Sunday I went outside the Convention Center for a quick bite to eat at a food truck; it was very hard to go back inside. The weather had turned from a rainy/windy 45 degrees to a sunny 75 in a matter of hours. There is always a bright side, it just may take you longer to find it. Call Wilson. Our cab driver. Surround yourself with people who will answer the call. The last thing is just a note of something very valuable for parents to remember and keep learning – let children fail. It was dimensionalized for me during two sessions about the principles of Gamification. This builds resiliency and drive to overcome obstacles. Don’t jump in to stop the error, don’t say “trust me because I have the experience” – unless it is dangerous. Let them learn and apply. Datebook is a window to the past. Facebook is a window to the present. I heard an interesting story on NPR’s Weekend Edition this morning entitled The Simple Joys of an old fashioned datebook. The story is about “holding time in your hands” and being able to see the whole year come flooding back through your handwriting, ticket stubs and other attachments. I love(d) my datebooks. I saved them year after year and then the digital age happened, I got all snarky and during a cleaning frenzy I tossed most of the datebooks. Oh, how sad I am now. 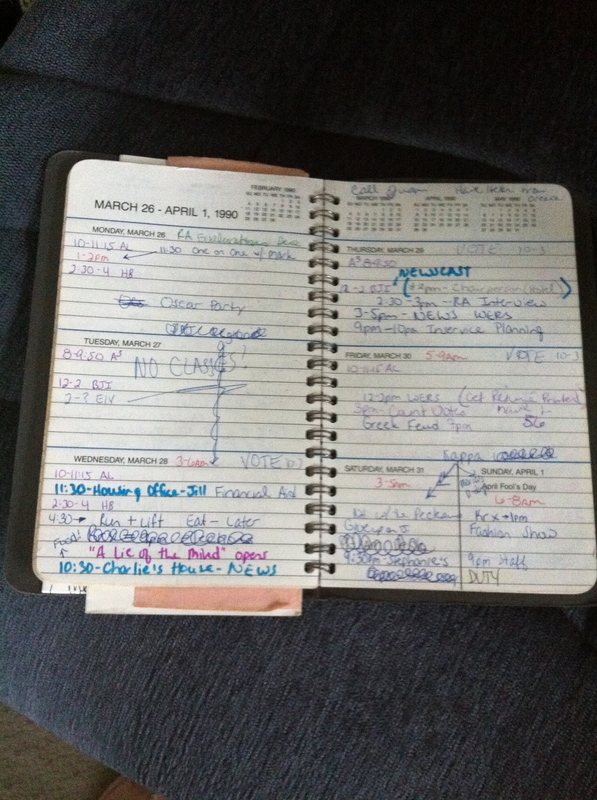 When I was home for Christmas last week, I found one of my datebooks from college. 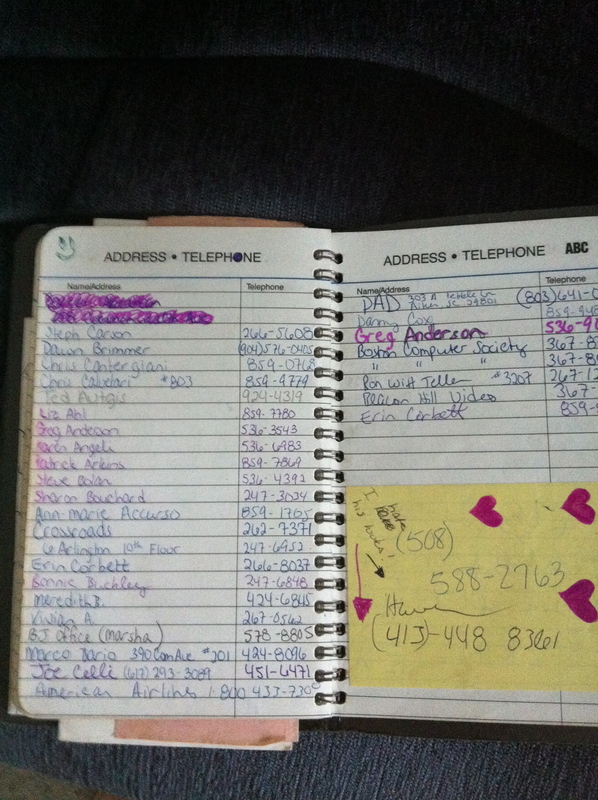 It was lots of fun thumbing through it looking at the different activities, but the best part was the address book with all my friends’ phone numbers. Many of the people in the book are now well-known in their field/industry, but when their name appeared in this little book they were just known to their friends and family (some would call this normal*.) Who knew there would be a critically acclaimed poet, an art director with multiple Emmy’s under his belt, a musician, a film director with an Emmy nomination or two, a few news anchors and investigative reporters, ad execs, heads of studios, accomplished television / movie editors, media moguls, television news producers, ESPN sports producers and on-air talent, to name a few? Emersonians knew. And there are many other people not mentioned above who are responsible for things not in the public eye – running charitable foundations, developing movie scripts, raising families, teaching musical theater, top of the heap salespeople in real estate and media, etc. I may start using a paper datebook again. Milking the memories. And thanks to the digital age – most of us are tangentially aware of each other through Facebook and try to get together whenever we find ourselves in the same city. *No matter what my friends are doing now, none of them is normal. They weren’t then and they aren’t now. It always rains on me in Puerto Rico and that’s ok. I am on a girls’ weekend in Ocean Park. We stay at the Número Uno Guest House. My two friends have been coming to this same place for eight years. My first trip here was their second year. It poured. And poured. We spent a lot of our time huddled on the wrought iron couches listening to the rain on the tin roof while deeply immersed in our books. My second trip here was their fourth year. It poured and was windy, but we did have a couple nice beach days. And now on my third trip here, I find all five (every year there is a different cast of characters who join the original two) of us huddled together in the courtyard talking about going to lunch; however there isn’t any power so we will just have to make due with the hunk of Manchego. I spent a lot of time worrying about leaving my family for four days. But my wonderful husband reminded me in his way that if I didn’t enjoy myself this time would be wasted. So therefore it goes to support the great advice – if you are going to do something do it well. Mother’s Day is more special to me every year – especially as my family has grown against the odds. I now have three beautiful thriving children. I also have family and friends and a great nanny who support us. We are fortunate enough to afford a nice life with clothing, shelter, food and fun. I count my blessings everyday day, sometimes more often. Digitas, my second home, has been working on promoting Cradles to Crayons these last few months. The team produced a wonderful video to get out the word about the organization who takes care of the more than 305,000 children in MA who need assistance. Here is the link to a 3 minute video, it’s well worth the time. You can also friend them on Facebook and follow them on Twitter. We are currently working on a collection of goods drive, so if you want me to bring anything in get it to my house by Monday night. You can also drive the stuff to their collection facility in Brighton. I am also thinking about military families. I grew up an Air Force brat, my mom had me when she was 21 and moved to Texas two months after I was born. She didn’t have a support system or very much money – but my parents had a lot of love. I am thankful she was too young to know the difference and living in a time where that was enough. However today’s military families are working hard to make ends meet and to raise their children when the moms and dads are gone for long assignments in the Middle East. My thoughts are with them. My Mother’s Day thoughts are also consumed with four strong women who are elderly, ill and grappling with the last stages of life. The struggle is that we know we all die, but it’s how that happens and when that is hard to watch and hard to do gracefully. So Happy Mother’s Day to everyone who is happy or struggling or healthy or ill. We need to milk the Happy and Healthy moments for those who can’t do it themselves. Predictions that TWO BILLION people will watch the Royal Wedding are swirling about. I will be one of them. I don’t have time to do a lot of things that I’d like to do in the day, but lucky for me the Royal Couple didn’t plan their wedding for a US audience and so I’m able to watch it AND be able to go to work. I am also hoping my sister watching with me @kteb. And of course my 4 1/2 will be watching with me. I have a good friend who did some digging and aggregated the best schedule of the festivities that I’ve seen – again saving me time. Love him! Thanks Emile. Now, the big question is how will this play in the social media space? I want to be watching instead of reading others’ comments of the same things that we’re both seeing on TV. I’m sure I’m not alone. But are there any feeds or people to follow that will have an inside scoop? If I have time to research before Friday, I will let you know. Am I that into Royalty? Not so much, but this is one of those events that we’ll talk about for a very long time…I feel bad for Henry, because there is NO way I’m getting up at 4am to watch his wedding. If anyone has good scone recipes, we’re on the look out…. 10:10 a.m. (5:10 a.m. Eastern U.S.):Groom Prince William and his best man, Prince Harry, will depart Clarence House. Their drive to the Abbey will only take five minutes. 10: 48 a.m. (5:48 a.m. Eastern U.S.): Kate’s bridesmaids and William’s pageboys will gather at the Goring Hotel to depart at 10:48 a.m. The wedding party will arrive at the church five minutes before the ceremony is to begin. 10:51 a.m. (5:51 a.m. Eastern U.S.): Catherine Middleton, accompanied by her father, will depart the Goring Hotel in a Rolls Royce and make her way to Westminster Abbey. Once she arrives at the church, details about her wedding dress will finally be revealed. A press release, including the wedding dress designer’s name and sketches and photographs of the dress, will not be sent out until then. 11: a.m. (6:00 a.m. Eastern U.S.): The bride arrives at the Abbey; the ceremony begins. The ceremony is to last just over an hour and will include vows and a sermon delivered by the Bishop of London, private clergyman to the queen. The bells of Westminster Abbey will ring as Prince William and his new wife depart the church. 12:30 p.m. (7:30 a.m. Eastern U.S.): Once the royal couple arrives at Buckingham Palace, they will pose for their official wedding photos. But those private moments between Will, Kate, their families and their bridal party will remain private. The palace staff says they “hope” to release some photographs the following morning. 1:25 p.m. (8:25 a.m. Eastern U.S.): The married couple will reappear on the balcony at Buckingham Palace with the Queen and their families for 10 minutes. We can only hope they will follow the example of William’s parents and mark the occasion with a public kiss.